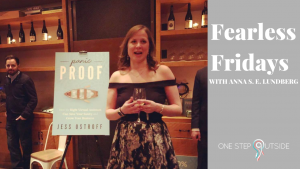 This month’s Fearless Fridays interview is with Anita Perkins. 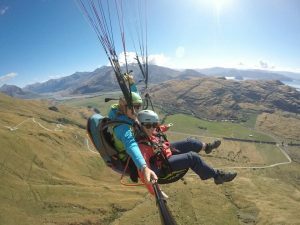 Having recognised that she was reaching the point of burnout, she made the ‘brave’ decision (although she doesn’t relate to that word herself) to quit her government job and explore what else might be out there. 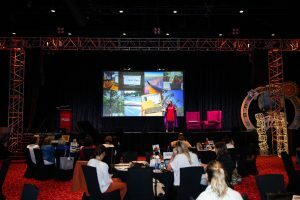 She took a year off to travel, including a trip to Everest base camp, and ended up setting up her own consultancy, through which she does a wide variety of different projects. 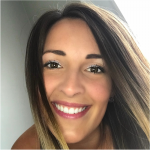 Watch the full interview below or read on to find out more about the moment when she decided that she needed to make a change, how she worked with both a life coach and a business coach to get the support that she needed, and what she’s enjoying most about her new life as an independent consultant. Anita Perkins comes from a background in academia, having completed a PhD in German literature. After she took up a role in government in Wellington, she spent the next six or seven years working in international relations as well as in environment and the arts. 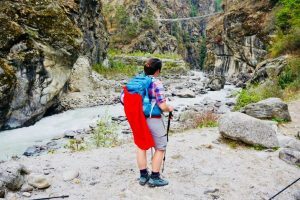 Last year, she started asking some important questions about what she was doing with her life, taking a year out to travel, hike to the Everest base camp, and talk to a lot of different people. As a result, she came up with the idea of becoming self-employed – and started Anita Perkins Consulting. Adventure is out there! Travel played a big part in Anita’s transition from her government job to setting up her own consultancy. I guess I’ve always had various role models. Both of my parents were self-employed at different times – my dad was a musician, and my mum was a counselor, before they retired. And I think having done my PhD, I also got used to motivating myself to show up every day and do the work. I’ve always toyed with the idea, then looked into several things, and also worked with a life coach, and I felt, “I might as well give this a go – and I have the friends, family, and financial context that allows me to do that.” It’s easy to get wound up about it and worried sometimes but, at the end of the day, the worst that could happen is that I would go back to a normal job. I think walking away from something, you feel a real sense of responsibility to the work area and the people that you’re working with. It feels hard to walk away from that and from what you know, and the security that comes with that. Some of the challenges are also around being proud of myself and communicating what I’m good at, but in a really authentic way; especially in a cultural context in New Zealand, which you might also find in the UK, where people don’t really go around blowing their own trumpets. So, how can you really convey that stuff that you’re good at? How you can help people but still do it in a really genuine way so that you’re building relationships and hopefully adding value to what other people are after? Anita had come to a point where she knew that the path that she was on wasn’t right for her, and it was time to make a change. When I first got a life coach, it was actually a suggestion from my mum! 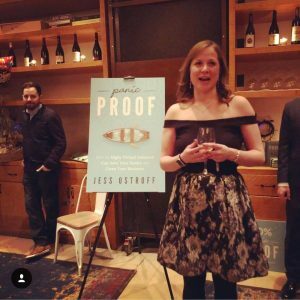 At the time, I had just moved from one job back to my old workplace and I started to doubt myself and my decisions, asking myself, “How did I end up in this situation?” I think I just needed someone to help me start building up that self-trust again, that confidence in my decision making and in the direction that I was heading. That was when I started to make a few changes, introducing a light routine – when I get up in the morning, I do a bit of meditation, and at the end of the day, I’ll write a gratitude diary with three things that I’m grateful for, one thing where I’m proud of myself for that day, and one thing that I learned. I’ve also worked with a business coach, which has been amazing – right from the practical things of “How do you write a proposal?” and “How much money do you charge?” through to “How do you identify your values?” and “What text do you put on your website?” That has really been invaluable. One thing I think that’s interesting is that a lot of people are saying, “Oh, you’re very brave to make this move, to try out this path!” – but it doesn’t feel like that. “Brave” doesn’t seem like the right word. To me, I had a situation where I wasn’t living my best life or being my happiest self, and so I needed change that situation. It was almost a logical, rational decision in a way – but also a very emotional and personal one, because you don’t want to let people down or get a bad reputation. I understand that I’m very privileged: the reality is that I don’t have to pay a mortgage, I don’t have children and some of those pressures that other people have; and I have a very supportive family and friends – so that makes it a very safe context for me. But I still think it can be about giving it a go and trying this out – and I think that’s where things are heading in the world anyway; it’s a good time to be trying these things. There’s a lot of variety: I’ve cast the net wide and I’ve had a really big range of roles. I’ve been working halftime pretty much on government contracts and then spending the rest of my time building up the website and getting new work. There’s also so much learning going on. I guess just really listen to that ‘thing’ you’re feeling. Life is too short, and there’s so much other stuff that you can do rather than keep going along that road. Even if a lot of people expect you to keep going, and it’s a well-trodden path, it’s not always the right thing for you, and you’re the one who has to live this life, every day. I would also say, really open the door – get out there and ask other people who are doing what you might like to do, how they got there, and what lessons they learned. Listen to podcasts, read your book! A lot of people want to have something very exact in terms of what they’re going to do next when they leave something, but as long as the practical side is there – you can still pay your rent and so on – then it really is worth the adventure of stepping out and taking that leap, and exploring what could work for you. You can find out about Anita’s consulting on her website, connect with her on LinkedIn, or follower her on Facebook. 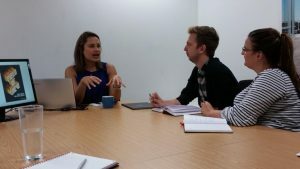 This month’s Fearless Fridays interview is with Joana Ferreira, who left her dual role in a digital marketing agency and a tech company to go freelance with her marketing and to become a part-time lecturer. Joana’s is an interesting (though not unusual) case as she didn’t dislike the work she was doing – it was more the logistics around travelling back and forth, as well as the profile of the clients she was working with, that led her to take the leap. She talks about how it was other people’s concerns that led her to question herself, and how she found a supportive online freelancing community to both encourage her and exchange experiences and expertise. 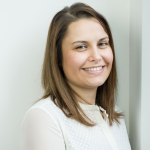 Joana Ferreira began a career in digital marketing in 2011, securing a junior role at a digital marketing agency. Within five years, she had climbed into senior management, running a very busy team, working across two locations, re-branding the company, and working alongside the head of agency to make decisions on the company’s future. By the end of 2017, she realised that although she loved digital marketing, she was no longer happy working at that intensity, under so much stress and in the 9-to-5 corporate environment. 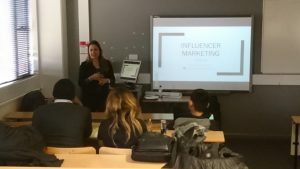 She set up her own digital marketing consultancy for small businesses, as well as becoming a lecturer at Manchester Metropolitan University. 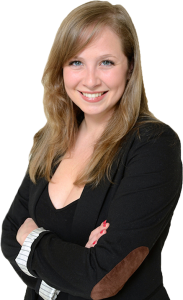 Laura’s work today is not totally dissimilar to what she was doing before, but she is now using her marketing skills to work with small, independent businesses and she’s also doing more speaking and training. I suppose the biggest motivator for me was having to travel from London to Manchester every week, so that I was spending three days in London, two days in Manchester. At the time, I was living in Stoke-on-Trent, so I was pretty much travelling across the country every single week, multiple times. It was very tiring, and of course it means you can’t really have much of a social life, and even for things like planning when you’re going to go to the gym, you need a whole schedule just for that. So it was a case of life was work, and work was life, and that’s not really how I like to live my life. Apart from that, it was also very a corporate environment, and very demanding, very long hours, a lot of long meetings, a lot of conversations before we actually made any real decisions. And for my style of working, I just prefer to get stuck into things; do things, be creative. Especially because I work in digital marketing, I like to experiment, try different things, and see if it works, and that was something that I was missing a little bit. And then of course when you work for an agency, the clients that you work with are bigger companies that can afford an agency. I always wanted in my heart to work with small businesses that need support but haven’t got the budget to hire an agency, and so that was in the back of my mind, eventually to be able to do that. So I had been building up in my head that we were reaching that time when I wanted to go out on my own, but I hadn’t quite figured out when and how that was all going to work out. And I think I’d just been having a really tough week. It was one of those weeks where I was in the office until late in the evening, and spending four hours in a meeting, and feeling like we still needed another meeting after that to finally get things going. I was meant to be staying in a hotel and, when I went to check in, they’d overbooked me, so they had to move me to a different hotel… It was just one thing after another, and it was one evening after dinner when I just said, “Okay, this is it. I’m going in tomorrow and I’m going to hand in my notice – and that was it! 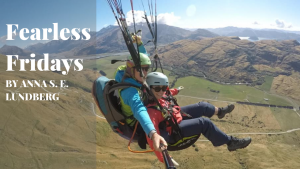 It happened to be at the end of 2017, so I gave myself until the end of year and then I took a couple of months off to just clear my head, and travel, and then start my new business. I think the first one that I came across was people. I wasn’t scared when I made that decision, and then suddenly people were scared for me, and I started thinking, “Should I be scared??? And then that’s when the worry started to creep in. Then I decided in January in 2018 that I was going to do absolutely nothing – I needed to clear my head, I needed to give myself some time… And that was the biggest challenge for me, actually, because I had been moving at such a fast pace. I had been constantly busy for five, six years, travelling and having a million things to do every day. Suddenly I had nothing to do, and that was really challenging. When I started freelancing, I didn’t really know any other freelancers because I had been employed for many years and all my friends from work were also employed. So I thought, “Well, I’m a digital marketing person, social media is what I do!” and I went on social media and started looking for different communities – Facebook groups, LinkedIn groups, and events as well in and around Manchester – where I could meet other people. Actually, I discovered that there was this whole world out there, a massive community of really supportive people who were also freelancing and were very supportive – it didn’t feel like a competitive world, it felt like a community. And everyone I came across was really open and willing to share their experiences, good and bad, willing to give advice without asking for anything in return. This was an eye opener in a very, very positive way and I still keep in touch with even the people that I met at the very beginning. I’ve ended up working with some of them or recommending them when I’m not the right fit, or they’ve recommended me when they’re not the right fit. And I think that’s probably what helped me the most in terms of figuring out how to go about being self-employed. Apart from that, friends and family have all been super supportive to the point where I’m even surprised at how supportive they are! I thought they would have been thinking that I was crazy, but actually a lot of them said, “Yes, you can do this,” and very proud and very, very positive. Joana discovered her love of teaching and, thanks to her new freelancing status, has been able to make time for lecturing at a university. One of the things I love the most is the freedom to choose what I work on. Obviously we have to be realistic in that we have to have enough work coming in so that we can pay the bills, but generally speaking, I’ve been able to work on projects that I really enjoy, and for clients where I really feel that we create almost a friendship rather than a client-supplier relationship. Apart from that, I had had in the back of my mind that I loved training. In my previous role I was a manager, and I got to work with graduates and apprentices and really nurture them from the very beginning of their career and watch them grow. That was something that I really enjoyed, and I had always thought, “Could I get into training or teaching or something like that?” And, now that I’m a freelancer, I’ve actually got the time and the freedom to be able to try and see if this works, which you can’t do when you’ve got a full-time job. Now, I’m almost 50/50 teaching and freelancing. I always follow my gut. If it doesn’t feel right, then I try to fix it; and if it feels like it is the right thing for me, then I always go with it. I try not to listen too much to the people who might be doubting it. So my advice is always follow your gut, follow your instincts – because they are usually right. I was very lucky that I had some savings so that I could afford to leave my job without having an immediate client and be able to take a couple of months off. Obviously, not everyone is in that position, so of course I wouldn’t say, “Leave your job tomorrow!” if you haven’t got enough savings. Everyone is different, so if you feel it’s right for you, then you don’t need to listen to anyone who’s doubting you. 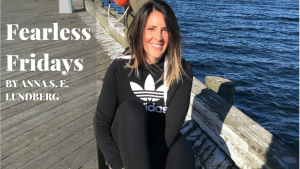 This month’s Fearless Fridays interview is with Laura Zinck, who I met on Instagram a couple of months ago (- don´t you love the connections you can make online?). She is a dental hygienist turned fitness coach. Read on or watch the full interview below to get her story! Laura Zinck was a dental hygienist for eight years, having studied for six years to do so. It was a “good job” but she didn´t love it, and she was also having bad back problems. After a lot of brainstorming, she remembered her favourite thing: health and fitness. 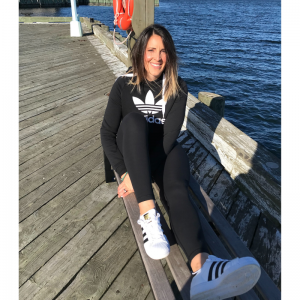 Today, she´s a fitness coach who helps women who have struggled with the cycle of dieting and binge eating to reach their goals without giving up their life (or pizza!) to do so. Laura used to have to squeeze in her gym sessions at 4.30 in the morning. Now, she has built her whole business and lifestyle around fitness and can work out when she wants! I will say that my husband has been super supportive – without him, I would probably have been on the streets! I literally had no job… He definitely pushed me, he said, “You know what, just leave. We’ll figure it out, don’t worry about it.” And so I guess I trusted him and trusted myself. So then I had to ask, “Well, what am I going to do now?” I did a lot of brainstorming and asked myself what I really love doing. In my spare time, I´ve always been at the gym or researching new exercises and diets and so on, and that was always what my friends and family asked me for advice on. Plus, I had struggled with binge eating for a long time. So I worked through my mindset issues around that – and now I help women do the same! I thought, “You know what? It’s now or never. Why not give it a shot? If it’s what I really love, then it should all work out.” And, so far, so good! I think it’s completely different than the idea that I had in my head when I first thought I would do this. I thought I would make a website, start an Instagram account and people would just flow to me! And I spent January, February, March, April – four and a half months – making my website all by myself, learning everything I could. Looking back now, I could have done it without a website! Not a single one of my clients has come from my website. So that’s four-and-a-half months that I could have been actually building my business and getting clients. But I thought I needed this website and I needed to master Pinterest and figure out all the SEO for everything and start a blog and all this crazy stuff. And you really don’t. Also just running a business in general. Being a dental hygienist, I wasn’t my own boss, so I never had to deal with any of that stuff. It has been a huge learning experience for me. Well, my husband could have said, “No, you have to go get a part-time job or something.” Instead, he said, “I don’t care what we have to do – I´ll get a second job to make this work for you. I know how badly you want this and I want you to be successful, so we’ll do whatever we have to do.” He´s one hundred percent supportive of me investing in myself and my business. Then the first thing I ever invested in was an Instagram course. That led me to the girl who made the course and I ended up hiring her to help me with my first programme launch. 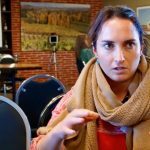 And in October, I hired my first business coach. I found someone who was where I wanted to be, and I think that’s my number one tip: if you’re hiring someone, make sure they are not where you are now, but where you want to be. Her coaching was just calling out to me, it was everything that I had in my head that I wanted to accomplish. I felt like it was meant to be, like I had to work with her. It was definitely super scary – it was a lot of money, and not money that I just had sitting in my bank account! So I thought, “Well, I’m just going to go for it.” Honestly, I would never be where I am now without investing in myself and taking the chance, knowing that you can benefit so much from other people´s help. Eventually, you could take the time and learn it all yourself, but that could literally take years. 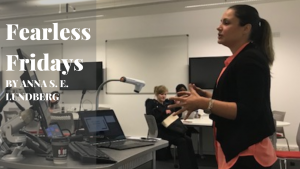 Thanks to a supportive husband and a couple of different business coaches, Laura has discovered that it´s absolutely possible to make a living doing what you love. When I was a dental hygienist, we worked three twelve-hour days each week. I would go to the gym before that, so I’d be up at 4.30 in the morning and get home at 7.30 at night for those three days, which were just a write-off. And then it might seem like I had a four-day weekend, but those days would be spent doing everything I couldn’t get done during the first three days! Now, I can be home with my three dogs and spend time with them, and I go to the gym when I want. I love working with my clients – I love all my clients, they’re amazing. And I´m doing something I actually love. It’s like you don’t even think it’s possible, honestly, when you are just working in a job – “Oh, I could never do that!” But it’s totally possible. Nothing has to be perfect, nothing. I know you think everything has to be perfect, but nothing does. Take that messy action and just do it. Because you’re holding yourself back with fear when you’re playing with your website for five months and you think that’s what matters; but it doesn’t. You have to step into that next level and just go for it. Take the messy action and everything will flow from that. Laura’s mission is to empower women through food and fitness. Discover more on her website, Squatting for Snacks, or on Instagramand Pinterest. 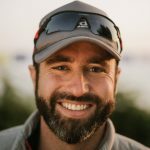 This month’s Fearless Fridays interview is with David Altabev, who I met on a paddle board in the middle of the Thames back in 2015. As I remember, he tried to film me while I was giving my best rendition of Pocahontas (it didn´t go so well, as he couldn´t paddle and follow me while also operating the camera!). Now, we´ve finally got on the phone to talk about his career transition as it has evolved since then. Read on or watch the full interview below to discover what made David take the leap, the challenges he has faced in juggling two very different businesses, and the importance of finding a mentor who can guide you on your journey – as well as believing in yourself and holding true to what you know. David Altabev was a Senior Programmer Manager at Nesta in the Government Innovation team, following what he calls “a fairly standard career path, employer to employer, job to job, just trying to climb the ladder”. Leaving in March 2017, he initially thought he was going to go and do another job but started freelancing while he was looking. 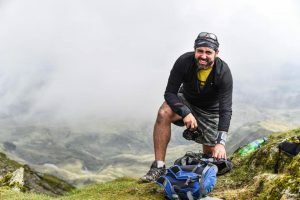 After a few months, he realised that freelancing would actually be a better way of determining what he wanted to be doing and finding his own clients. 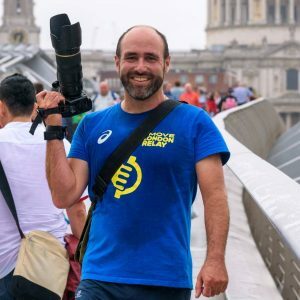 He ended up starting two businesses: one, consulting in the same field where he had been working previously, though more specialised, and, two, formally setting up David Altabev Photography. He has been juggling the two businesses since then. In addition to his urban innovation consulting, David decided to formalise his photography into a business. I think a lot of it came down to realising that I was self-sabotaging in job interviews because I didn’t actually want another job. I had known that I wanted to freelance, forging my own path, for quite a while but I had a certain fear about it. So probably I was going to these job interviews not really wanting them. What I also realised was that I’m not very good at selling myself. I’m not very good at going, “Hey, I’m David. I’m great. I’m fantastic. Ooh, look at me.” What I am very good at doing is being inquisitive about people’s problems and challenges and helping them devise solutions or strategies for them. So, whenever I was meeting clients and I would have those conversations, they would suddenly say, “Well, can you do this for me? Can you help me out with this?” And suddenly I realised that, actually, I was building a freelance career without even realising it. Clients were coming to me and going freelance and building my consulting business rather than being an employee was actually playing to my strengths. I think the reason I did both at the same time initially was that I knew that doing the consultancy work based on my previous work experience was where I had my contacts, where I had customers, where I knew what I was selling, and it was easier. So I told myself that I’d do that initially because that would provide me with some stability and the foundation with which to pay bills. Photography was a whole totally new world that I knew would take a long time to generate income would be much more difficult. Fortunately, or unfortunately, depending on which way you look at it, my consulting took off. And suddenly I was thinking, “Oh, I’m doing six days a week and I’m having to turn work down,” and I was really finding it difficult to squeeze in the photography and the more creative side, having time to just be more adventurous, all that kind of stuff. After a while, I suddenly reminded myself, “Why did I actually do this in the first place?” And I had to stop and take a step back and write down the reasons why did I want to go freelance in the first place. Really, it was to be more in charge of my time, to have time to do photography and adventure stuff; maybe work a bit less. I realised I’d been driven by the freelance fear of what happens if the next client doesn’t come, and always taking on the next job, and I suddenly got to the situation where I was working harder freelance than I had been when I was full time, and losing sight of the reasons why I started in the first place. The biggest challenge is that you go for what you know, what’s comfortable. The bulk of my income comes from me doing similar types of work to what I did when I was a full-time employee. Because that’s the easiest way to get going, to create income; that’s where you almost subconsciously focus more of your efforts, where you become known. So that’s the biggest challenge, deciding how much time and effort you’re going put into each business and managing multiple clients and expectations, and wearing lots of different hats, trying to jump between doing consultancy work and photography work. The two businesses are very different in terms of their marketing, their customer acquisition, and, most importantly in terms of the mindset and head space that you have to be in to do each one of them. Trying to switch from one to another in the same day or week can be quite challenging sometimes. And carving out the space for both of those has been really difficult. I think possibly the biggest challenge I had from a business standpoint was: “How do I price myself? What am I really worth?” Initially, I had a lot of people telling me to go down on price – but I don’t want to be known for cheap work. So I went quite high, and it worked, and I’ve gone higher since. People were very surprised at that, and especially those that don’t really understand your industry, they don’t know where you’ve come from. You have to be very careful about sticking to what you know, and knowing your worth. I think there’s a tendency that people feel if you’re going freelance and living this whole adventure lifestyle that your income has to almost stop completely – you’re not making any money, or your value somehow diminishes. You can still do high-value work, just in shorter, more intense periods! There is also a degree of vulnerability, and always having to maintain that confidence that what you’re doing is right for you. There’s the, “You’re trying to leave your full-time job to go and do what exactly?” There are still a lot of people for whom it’s so beyond their comfort zone or their thinking that they just look at you and go, “Dave, are you really sure about that? How often do you get a full-time job with a pension etc., why do you want to go and do this where you don’t really quite know what you’re doing, why don’t you just keep that as a hobby…?” It’s being constantly vulnerable to a certain degree and I think that’ one of the hardest emotions to get used to, if I’m being honest. Talking to friends, talking to people who’ve done it before, is always my “go-to” strategy: finding people who you can be honest with and who will give you constructive feedback. In photography, I´ve asked how other people´s business models work, how they acquire clients, while on the consultancy side I´ve had honest chats with some of my clients about the dual personality that I have and the reasons why I’m living my life the way that I am. Finding people who can effectively be your mentors is really important. 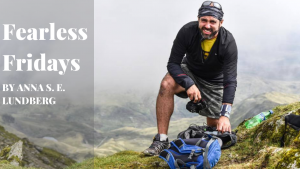 One of David´s challenges is balancing the mindset and marketing required for taking photos up a mountain with the very different mindset and work required for his consulting business. Knowing that I’m directing it, that is the main thing. I’m not beholden to anyone else, I can chop and change clients and the direction as I want; it’s really down to me and my comfort levels, what I’m willing to throw myself into. That and the variety. People’s perception of what I can do now that I’ve been dependent is so much more varied compared to when I was working in a role with a narrow job title. That’s what I’ve really enjoyed, being able to flex other muscles in terms of creativity and roles. I think one of the most interesting journeys that I’ve experienced in the last 18 months is how other people define my value and what I can do. Previously, being in a job, I was defined by my job description or job title, or what the organisation did; being myself and my own person, with the opportunities I’ve been able to create, the variety of work I’ve done has been huge. And, in particular, the level of work I’ve done has increased dramatically in terms of seniority. I’ve jumped about two or three levels in the last year that I wouldn’t have done in my previous career for another five years. Believe in yourself. That’s the hardest bit but if you don’t, then no one else will. It’s really believing that you can because so many other people have gone out there and done it before you. It is scary, but it’s totally doable. And if it doesn’t work you can fall back into a job. Best to try! It is a journey, though: don’t expect success overnight! My first six months were a bit dire, sitting in coffee shops, trying to find work – it was horrible. And then, suddenly, at one point, it just flipped, and it went the other way. But it took about a year or so. So be prepared! It won’t come overnight, it’ll come from hard work. Discover David Altabev Photography on the website, on Facebook and on Instagram. You can find out more about Jess’s company, Don’t Panic Management, on her website. You can also follow her on Instagram and connect with her on LinkedIn. Make sure you also check out her book at panicproofbook.com.